A signature, four-year program for undergraduates — made possible with a $1.5 million gift from the Marianist Province of the United States — is slated to launch at Chaminade in fall 2018. The Marianist Center for Leadership Development will stress learning and community building opportunities aimed at helping students grow as lifelong learners, civic-minded members of society — and leaders. 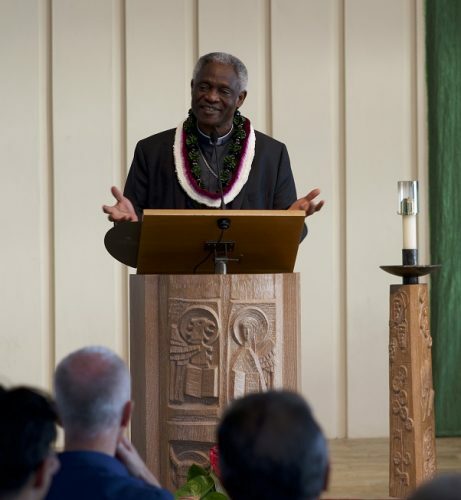 And it will be uniquely place-based, incorporating Marianist, Catholic and Hawaiian values and the principles of ethical leadership. Dr. Lynn Babington, Chaminade president, noted that the university already counts it as its mission to teach ethical leaderstoday. 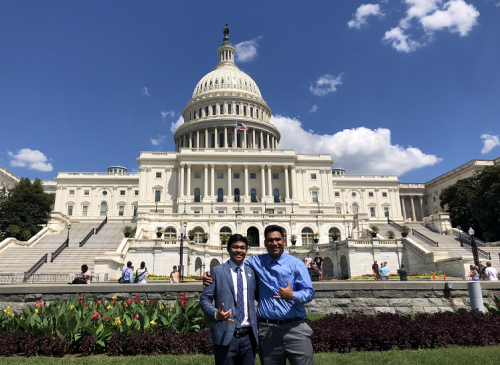 To accomplish that vision, Chaminade sponsors a number of leadership opportunities for students, from peer tutoring to student ambassador programs and from athletics to ministry. Offer undergraduates a differentiated growth opportunity. Place experiential learning and civic engagement as the focal point of a rich course of study that will introduce students to a variety of leadership theories. And encourage participants to practice effective leadership in their own communities. 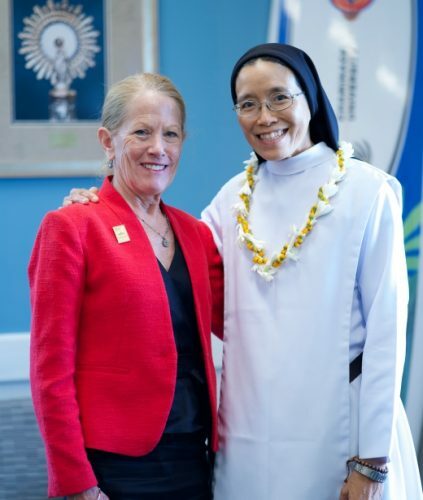 “The Marianist Center for Student Leadership will deliver a core set of content and experiences through which students will learn about leadership models and develop the skills they need to positively impact and transform the world around them,” she said. And it will foster new connections among diverse groups of students. Participants in the program will bring different scholarly interests, ways of viewing the world, and opinions about what ethical leadership looks like. They’ll also bring different ideas about how to carry it out. Of course, Chaminade celebrates a strong Marianist heritage that dates to the University’s founding. Those values will prove central at the new leadership center. Students who complete the center’s four-year program will also earn a certificate of leadership development, and they’ll be versed on differing leadership models thanks to hands-on learning and assessments. The center will be directed by Chaminade’s vice president for mission. Read Dr. Lynn Babington’s Pacific Business News Interview here. As a highlight of Founders’ Week activities at Chaminade University, Vice President for Mission and Rector Bro. Edward Brink, S.M. presented the annual Heritage Awards to faculty and staff members and a student for their continuous commitment to Marianist values. Receiving the Chaminade Award at the Founders’ Eucharist for exhibiting “traits of openness, hospitality, graciousness and faith in a loving God” was School of Business and Communication Dean Scott Schroeder. “Colleagues describe Scott as gracious and welcoming,” Bro. Ed said. 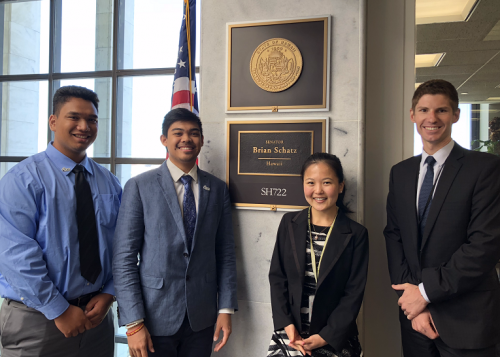 “His openness to new ideas and suggestions points to his collaborative style of leadership.” Students who worked with Dr. Schroeder describe him as “thoughtful, caring and approachable” and able to motivate and inspire them, Bro. Ed added. A Marianist Educational Associate since 2014, Dr. Schroeder was a postdoctoral fellow in the Management and Leadership in Education Institute at Harvard University. He received his Ph.D. from UCLA, an M.B.A. from Arizona State University and a B.A. from Santa Clara University. Dr. Schroeder donated the $250 cash award he received to the Accounting Student Scholarship Fund. 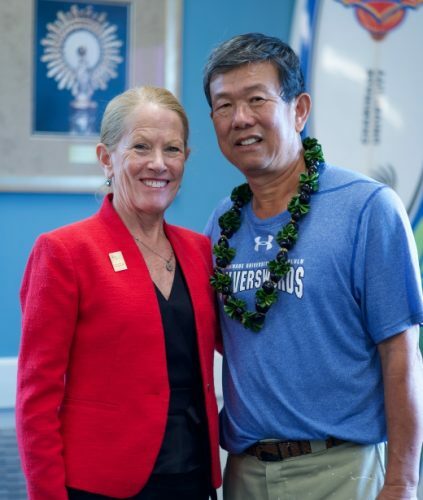 This in memory of founding accounting faculty member and longtime Chaminade trustee James Wong, who attributed his success in life to the influence and hospitality of the Marianists dating back to his high school days. Fineisaloi, who became a Marianist Educational Associate in 2014, earned a M.S. in Counseling Psychology and a B.A. in Psychology from Chaminade. 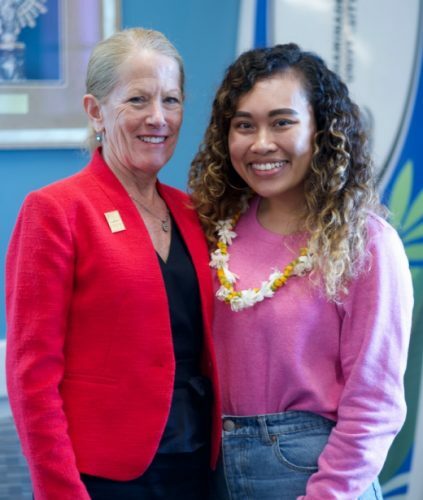 She donated her cash award to the campus Micronesian Club and the Tales and Treats program, in which students read to children at community centers and provide them with nutritious snacks. Presented with the Founders’ Award was student Vanessa Ignacio, who maintains a 3.4 Grade Point Average while majoring in Biology major and minoring in Chemistry. After graduating from Chaminade, Ignacio will attend A.T. Still University School of Osteopathic Medicine in Kirksville, Missouri. She eventually intends to practice family medicine on the Big Island. 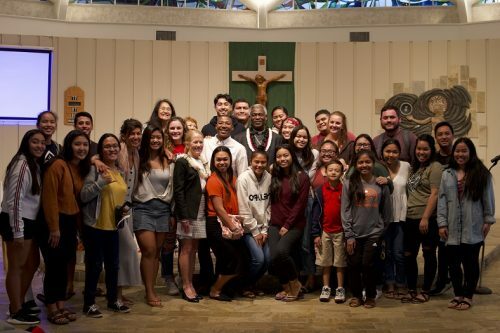 “One of Vanessa’s nominators referred to her as the ‘epitome of a servant leader’ and indicated that Vanessa was able to see the presence of God in the people who are part of her journey here at Chaminade,” Bro. Ed said. A member of the Eia Kou Makuahine Student Marianist Lay community, Ignacio serves as the Filipino Club social chair. She also served as a Vice President for Student Government and as Rectoress on the university’s Awakening Retreat. Ignacio designated her cash award to support Campus Ministry, which has “given me priceless memories, unending joy and a lifetime family,” she said.